One-Third Of Everest Deaths Are Sherpa Climbers : Parallels The job of guiding climbers up the Himalayas has brought money and development to their communities, but little glory for the Sherpas. 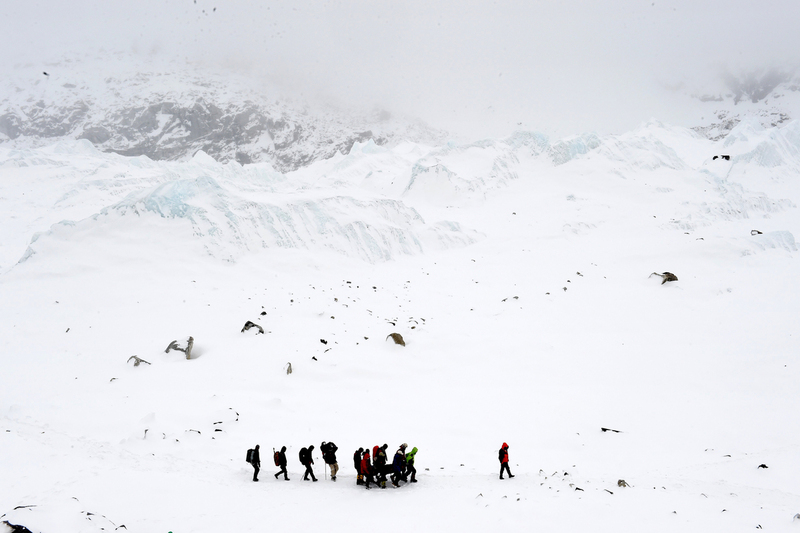 Rescuers carry a Sherpa injured by an avalanche that flattened parts of Everest Base Camp on April 25, 2015. A 7.8 magnitude earthquake hit Nepal and took at least 17 lives at Everest Base Camp, including seven Sherpas. 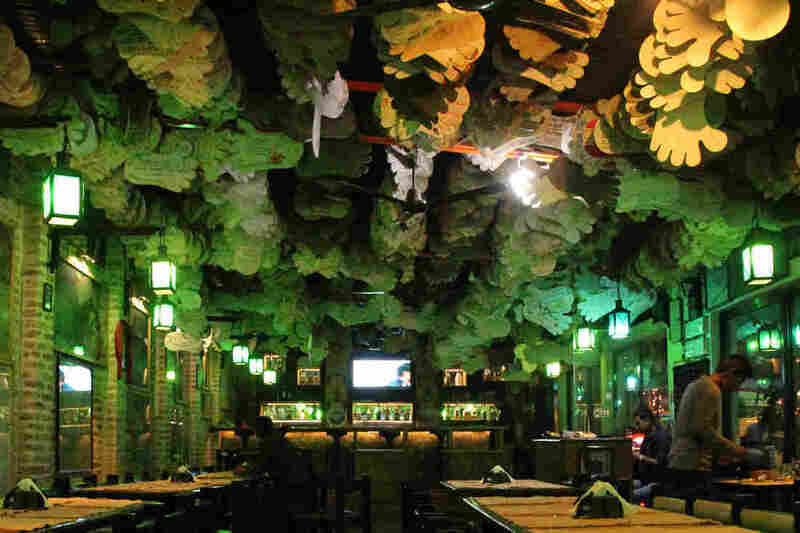 The autographs of people who have stood atop the world's highest mountain line the walls of the Rum Doodle Bar and Restaurant in Kathmandu. The best known is the late Edmund Hillary, half of the two-person team that first reached the top of Mount Everest in 1953. His climbing partner, the late Tenzing Norgay, was a member of Nepal's Sherpa ethnic group. Near a photo of Norgay, draped with a red Buddhist scarf, are signatures of Apa Sherpa, Lhakpa Ghelu Sherpa and Babu Chiri Sherpa — who have set records, respectively, for the most number of summits, fastest summit and most hours spent on the top. Most Sherpa climbers work on the mountain. They guide foreigners to the top, set ropes and ladders, and carry everything from food to tents and oxygen canisters up. These jobs have brought money and development to their communities, but little glory for the Sherpas. For the last two years, Sherpas haven't even received the certificates foreign climbers do to prove they reached the top. Gyanendra Shrestha, an official with the Tourism Ministry, says the problem is being resolved this season, but sees it pragmatically. Foreign climbers bring a lot of money to Nepal — $11,000 just for the Everest climbing permit. Most Sherpas, he says, are just doing their job. It just happens to be one of the most dangerous jobs in the world. Some 290 people have died climbing Everest in more than a century of attempts, according to the Himalayan Database, an archive that tracks expeditions in the Nepalese Himalayas going back to 1905. About a third, 94, have been Sherpas. By comparison, just 13 Americans — a leading nationality of the climbers — have died on the mountain. During the first real summit attempt in 1922, seven Sherpas died in an avalanche. Another avalanche in 2014 took 16 Sherpa lives, and became the deadliest day on the mountain — until the following year, when a 7.8 magnitude earthquake hit Nepal and killed at least 17 people at Everest Base Camp, including seven Sherpas. There have been no Sherpa deaths on Everest since 2015, but other mountains continue to kill. The most recent, according to the Himalayan Database, was Ang Ngima Sherpa who fell to his death after becoming hypothermic while summiting the almost 27,000-foot Dhaulagiri mountain in May 2017. While Sherpas are on Everest in much greater numbers than people from other countries or ethnic groups, they also spend much more time exposed to its greatest dangers. The most dangerous section is the Khumbu Icefall, where house-sized slabs of ice hang and sometimes break off. Most foreign climbers pass through the Icefall just a few times. But Sherpas working on the mountain might make 15 to 20 trips through setting equipment and carrying gear. Some of Everest's bravest workers are called Icefall doctors. They spend up to 16 hours a day in the Icefall attaching ropes and ladders. Twenty-six-year-old Geljen Sherpa just retired from that job to the relative safety of climbing with clients. "This climbing also I don't like. I'm doing for my family because I don't have education. If we don't have education, we cannot get good job," he says. Geljen Sherpa retired last year from working as an icefall doctor, a job that requires spending up to 16 hours a day attaching ropes and ladders on Everest's most dangerous section. This year he will provide support on an Everest expedition instead. Phurba Sherpa has stood on top of Everest 12 times as a porter and guide. Five of his brothers have summited, too. On his first expedition, just west of Everest on Mount Pumori, one of the brothers died in an avalanche that killed three other Sherpa climbers, too. "I give up. I promise I never climb mountain and I went in my valley, but one year I changed again my mind because I need money," he says. Phurba earns $8,000 to $10,000 a year guiding on Everest — about 10 times what an average Nepali makes. 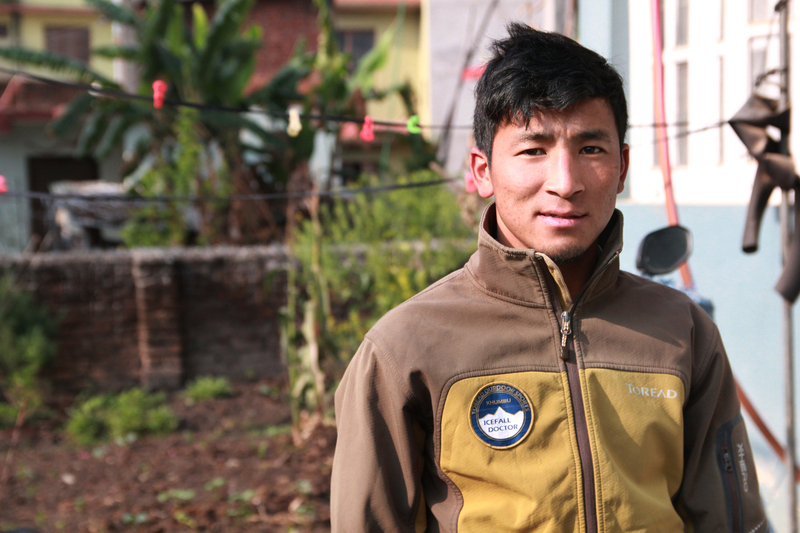 Some of his brothers have given up climbing for safer work in Kathmandu, but a new family member might join: Phurba's sister. Her husband was one of the casualties at Everest Base Camp during the 2015 earthquake. Phurba is encouraging her to start climbing. After 16 Sherpas died in the Khumbu Icefall in 2014, safety concerns grew and so did demands for change. The government started requiring guiding agencies to increase the life insurance policies they purchase for Sherpas from $10,000 to $15,000. This sum barely puts a dent in the loss of a family's breadwinner, so fundraisers by climbers help too. Helicopters are also being used a little more to ferry, saving trips by Sherpas, and perform high altitude rescues. Rescues of hired climbers are paid for through government-mandated insurance policies; sometimes companies pay the difference. Another solution is to climb from the somewhat safer northern face in Tibet. There's also a push for more technical training, which helps Sherpa climbers who often start on Everest because of strength and endurance, but without much training. After her husband, Alex Lowe, died while climbing in Tibet, American Jenni Lowe-Anker started a foundation in his name, and the Khumbu Climbing Center to teach safe mountaineering. She says many students in their first class had already summited Everest, but didn't know how to tie basic safety knots. Sherpas often need those rescue skills to save clients and colleagues. Sange Sherpa came close to joining the list of Everest casualties last year. The 19-year-old was working his second season on the mountain, guiding a Pakistani client who, according to Sange, denied his requests to abandon the summit attempt, when the weather turned bad. Both men wound up unconscious in the snow on the descent. Sherpa men from another team found the climbers close to death and brought them down in time, but Sange's hands were so frostbitten, amputation seemed necessary. He's now undergoing surgeries in Denver, thanks to supporters and a GoFundMe campaign. Sherpas who have earned a decent living by climbing are now looking for other opportunities in the field, says Thaneswar Guragai, manager of Seven Summit Treks. As pressure from worried families builds, and if they can find alternate work that pays enough, "they prefer to have a good life not climbing," Guragai says. Seven Summit Treks was founded by brothers Mingma Sherpa and Chhang Dawa Sherpa, who largely traded climbing for management after summiting all 14 of the world's 26,250-foot peaks. "But there are still some people who really want to climb. They have enough money, but they really want to climb." Guragai says. Geljen Sherpa, the retired Icefall doctor, is climbing with Seven Summit Treks this season. He recently moved his family to Kathmandu, where his 5-year-old son Lhakpa Geljen Sherpa is in kindergarten. Lhakpa might grow up to be a climber like his dad. But Geljen says maybe he'll be a pilot or a doctor or an engineer. He wants to be sure his son has the choices he didn't have. A person previously quoted in this story incorrectly stated that Tenzing Norgay, the late Sherpa climber, was not literate and could not sign his autograph. In fact, Norgay could read and write and signed many autographs. The quote has been removed.